Another bright and early start to our third day in Paris. A quick cafe breakfast and then a short walk over to the nearby post office to try and change money. This time we were told that they could change all US$ bills except for hundreds. (Now, who would travel with cash in small change?) My mom was frustrated that she couldn’t get her money changed so we went to Le Bon Marche instead for some retail therapy. After repleneshing our stock of face creams and lotions, we walked to our lunch reservation on rue du cherche-midi at Les Terrines de Gerard Vié. We arrived on time to a cozy square room lined by a red banquette on three sides. In the middle of the room was a display table with a leg of ham (Jamon Iberico) and a selection of cheeses with some assorted jams. The bare wooden tables were set with simple cutlery and a crisply ironed tea towel as a napkin. There was a large blackboard on one wall with the plats du jour listed – saute de veau (sauteed veal) was the special on that day, while for example there was a fish for Fridays and roast lamb on Saturdays. The menu is limited with the usual prix-fixe of €24 for two courses (starter and main or main and dessert) with a beverage included in the set price – a glass of wine – red, white or rose, draft beer, still or sparkling water, or coffee or tea included in the set price. The three-course set menu was priced at €34. There is also a very short a la carte menu with specialties like foie gras and a few other main courses. As the specialty are terrines, we both opted to start with a different one – terrine de volaille for my mom and the vegetable terrine for myself. Both arrived quickly and were quite large portions. My vegetable terrine was topped with gellied asparagus and filled with cubes of carrots, beans, peas and some lardons (bacon pieces). An interesting and refreshing mix. My mom’s terrine was a slab made of chicken and chicken liver over chopped capers and cornichons. Hers was the definite winner of the two – flavorful and delicious eaten with bread. Her main course was Brandade de Morue (salt cod and potato pie) served with some lettuce hearts while mine was the daily special of sauteed veal with spring vegetables. The fish pie was very filling and although good, it was quite a heavy dish for mild weather. This time around it was my dish that stood out – the simple classic dish was well-executed with the veal chunks perfectly cooked and accompanied by a rich jus and tiny pieces of carrots, turnips and peas. We decided to share a dessert of fresh strawberries and creme fraiche. The berries were sweet and fantastic with the slightly sour taste of the thick fresh cream. Espressos to end the meal as usual and a very reasonable price of €65 for two. Service was attentive and not rushed and the place was filled with locals from the quartier, and aside from ourselves, no other English speakers were present. 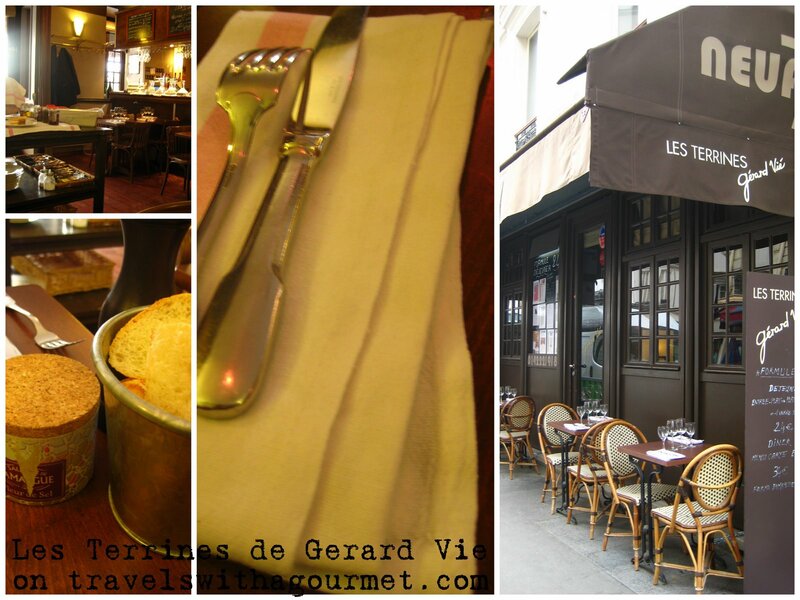 Les Terrines de Gerard Vié is French comfort food – classic dishes a bit on the heavy side and best enjoyed in the cold of winter although our meal was fine as the temeprature had dropped a bit by the time we finished and the hearty dishes kept us warm for the short walk home. Thanks for checking in! I’m glad to hear that you are a Gerard Vie fan.